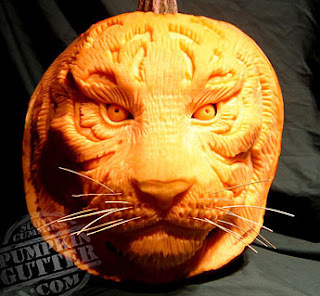 Thursday, October 29 is Pumpkin Decorating Day and also Sports Day. Dress up in your favorite sports apparel and show your school spirit! The class with the highest percentage of dressed up kids gets a prize. Bring your carved/decorated pumpkins to the multi-purpose room by 8:15 a.m. Entries will be judged in several categories: Best Movie or Comic Character, Funniest, Weirdest, Scariest, Most Creative, Most Artistic and Best Traditional. Don't forget to take your pumpkin home at the end of the day! NO SCHOOL FRIDAY, OCTOBER 30! Next Week (Nov 2-6) is the Book Fair in our library. Take this opportunity to purchase books that kids love and holiday gifts and support your school. That week is also Parent Conference week. Have you returned your appointment confirmation? We will follow the short day bell schedule and school will let out at 1:00 p.m. Teach Electives start November 12. We still need a few instructors - if you have a hobby or skill you'd like to share and are available to teach 5 afternoon classes, please see Dan Block! 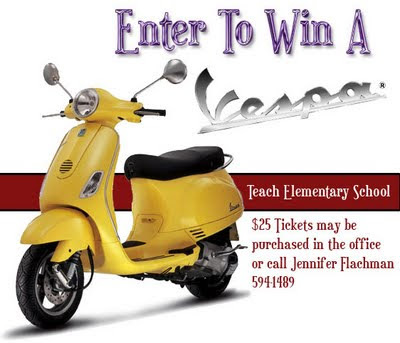 Enter to Win a Vespa!! Ask a Teach student for tickets! Thanks so much to all the parents that are attending our Booster's Club meetings!! Our next meeting is November 6 at 8:30 a.m. in room 24. Watch a cow plop and win a thousand bucks! This is an important fundraiser for our school - get involved and make it fun!! Parent Conference Week will take place November 2-6. During this week, school will dismiss at 1:00 PM for grades 1-6 (normal day for kindergarten.) We need your help to schedule conferences. A scheduling notice will be sent home with all students today (or you can print your own using the following links). Please let us know your available times for conferences and return the notice to your (oldest) child's teacher by Friday, Oct. 16. A confirmation of your appointment will be sent home with your child. Please note that there will be no school on Friday, October 30, to allow the teachers time to prepare for conference. If you need childcare on the teacher workday, there is a camp offered by SLO Parks & Recreation. Please note that if your child attends Sun 'n Fun or STAR, they must sign up separately for the early dismissal time (1-2:30) in order to attend. Call the Parks & Recreation office for more info at 781-7300. Teach Electives will be taking place on the following Thursdays: November 12 & 19, December 3, 10, & 17. The Electives will run from 1:00 to 2:15 in the afernoon. Electives are typically taught by teachers and parents of Teach School, and generally have 8-10 students in each class. These five sessions are a great opportunity for parents to share a hobby or activity with the students. Last year some of the classes taught by parents included cooking, interior design, yoga, art, pet care, drama/productions, and strings. Parents are needed to teach this year's classes. If you have a hobby or skill you'd like to share with students and you are available on the dates above, please contact Dan Block! Bishop's Peak/Teach parents are so wonderful. A special thank you to Jodi and Brian Evans, Sharon O'Gara Gaines, Julie Bray-Kalenian, and Candice Wong who brought in delicious treats and flowers to brighten our morning Monday. You're the best! Watch for the Swap & Shop collection boxes in the courtyard this week and bring in your items (clothing, toys, books, etc.)! Then have fun and shop after school Friday! At Public Health: Flu Mist is available on a limited basis for kids with no illnesses/asthma/allergies. Call 781-5500 for appt. At CHC, San Luis Obispo: Flu Shots are available on a walk-in basis every Saturday through October between 1:00-5:00 PM. Kids $15, adults $20. General info: 269-1500. If your primary care doctor is at CHC, it would be best to make an appointment for the flu shot as it is free with Cencal/Medi-Cal insurances. 1st grade and 4th grade girls clubs now forming from Bishop Peak/Teach School. Meetings are held once a week for an hour to work on projects, earn awards, play games, learn new songs, crafts, explore outdoor activities, take field trips and give service to the community all while making new friends. Learn more about the Girl Scout program and make new friends! Open to girls grades K-6. Tuesdays starting Oct. 20, 2:30-3:30. Enthusiastic, hands-on science labs! "Strengthening Families" is a fabulous program facilitated by Drug and Alcohol Services but is open to any family in need of parenting skills classes/group sesions. We have had a couple of families participate in it and have found it to be extrememly helpful. Transporation, dinner, and childcare is provided. The following links contain more information. Also, following is the current flyer for the Parent Project Support Group class offered through Adult School. For this class, the parents have to have completed a Parent Project class previously. The Adult School will be offering the regular Parent Project class in Winter trimester. Don't forget to check out http://www.sloparents.org/ for other parenting classes and resources currently available. 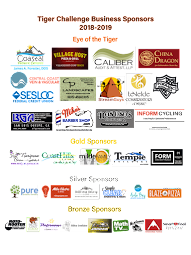 BISHOP'S PEAK CARNIVAL TONIGHT! 5:30 - 8:30 p.m. Invite the neighborhood! Fun for All Ages. I. Welcome and approval of September Minutes. Minutes were approved by Anne Slocum, and seconded by Bonnie Achugbue. II. Principal's Report: The 6th graders had a great time in Catalina. Mr. Block wanted to thank all of the chaperones for all of the time that they gave. Thanks to Boosters for making this trip happen. The trip will give our kids great, lasting memories. Flag salute was held this morning. The 6th grade class assisted with that. Next Friday, Oct. 9 is the Bishop's Peak carnival. All are invited. There is a $10 fee for a wrist band that lets you play all of the games that you would like. There is also a BBQ, and and auction. The new 5th grade teacher, Mrs. Kelly will come in to talk with the Boosters later this morning. This year, both schools will feature a Science Fair, in February. Everyone is to participate. III. New Business: There was a lot of discussion regarding the Fundraiser Dinner. Last year's expenses were $7-8,000. The profit was $15,500. Last year 120 tickets were sold. It was held at the Country Club and was a Dinner/Dance/Auction. This year, we are looking at a different venue, at lowering prices, and at making it more family-friendly. We would also like to get more alumni to attend. 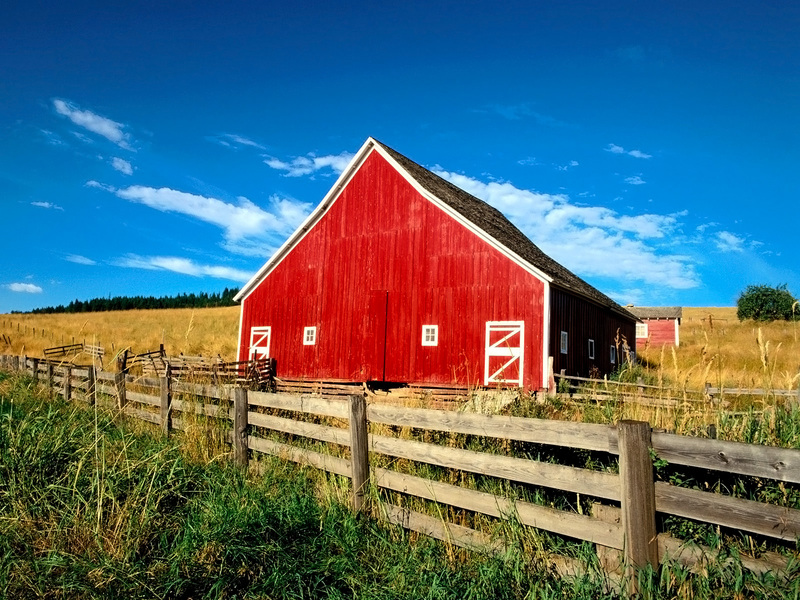 Kathryn Rogers has volunteered her ranch and barn for the event. Jen moved that we have a BBQ at the Rogers ranch. Mary seconded it. All were in favor. None opposed. The date was set for Nov. 8th. Mary moved in favor. Cheryl seconded it. All were in favor. None opposed. Nov. 15 will be used as the back-up date in case of rain. A chairperson is still needed for the event. Next, there was a discussion about whether or not to have an auction. It was decided that due to the time constraint, there was not time for an auction. So, there was a motion by Mary to have one large item, such as a car, to raffle off. Bonnie seconded the motion. There was talk about getting a car, such as a Honda Hybrid, to be raffled off. Also, Kathryn suggested an idea that is used at a school in Morro Bay as a fundraiser--Cow Plop Bingo. A field is spray painted with squares, and then fenced off. A cow is put in the middle. Bingo tickets are sold, and then wherever the cow plops, the person holding that ticket wins. Mary moved that we also use this idea. Bonnie seconded. All were in favor. If this fundraiser doesn't pan out, we would still have an opportunity to do another fundraiser in the spring. A committee will be formed and ticket prices will be discussed in that committee. --Mrs. Kelly then came in to meet the Booster Club and to discuss Teacher business with us. Mrs. Kelly is enjoying her time teaching the 5th grade. The teachers had a staff meeting, where they discussed the Science Fair, Battle of the Books, Electives, and T-shirt designs. Electives will begin Thursday, November 12, and run 6 weeks. The electives will be on Thursdays from 1:30-2:15. There was a question regarding how parents can volunteer to help. Parents should contact a teacher or Mr. Block about volunteering for Electives. Derek Gragson volunteered to teach a Science Fair 101 course with his wife, Grace. T-shirt designs were passed around. If we go with a new design, it will be less expensive than changing the design. Cheryl Clark has been checking out the T-shirt costs, Sunshine Cowgill volunteered to take over for Cheryl, as her husband works in graphic arts. There was a vote about the designs and it seems a new design is wanted. Kathryn made a motion to agree to a $100 max. set-up fee for a new design. Anne seconded the motion. All agreed. None opposed. There is now a girls t-shirt too. The color of the t-shirts will be black, with white lettering (Black and White are Teach's colors). There will be a picture of a Tiger on the shirt. There will also be sweatshirts with hoods. All were in favor. More news of the t-shirts to be coming soon. Due to the BBQ set for November, the Chili Cook-off will be put off until later, possibly January or February. Sunshine talked about the Teach blog that is conncected to the website. All meeting minutes will be posted there. IV. Financial Report: Anne gave the financial report for Ahmad Amir, who was not able to attend the meeting. Statements will be going out in the mail soon, so that you will know where you are in your payments. Genevieve is being tallied as we speak. The teachers have asked for $400 per class to pay for supplies. Anne moved to agree to that. Christina 2nd this. All were in favor. None opposed. Also, the Librarian, Mrs. Williamson has asked for some money this year. Anne is going to check with her as to how much she needs, and get back to us. At 10:00 a.m. I had to leave the meeting. It was adjourned soon after. **Please note - there will be no Fall Harvest Party around Halloween. We will have this the Friday before Thanksgiving. This is an entire school decision.